Has it happened to you? There you are, paying your outrageously high electricity bill, and wham - a sinking feeling envelops you. You wonder how Vijay Mallya could walk away with crores of unpaid loans when a single unpaid bill can render you to darkness for eternity. Your misery doesn’t end. Because when you are debating dinner choices, Vijay Mallya is perhaps debating which plane to board - a Hawker or a Gulfstream. Let’s face it, if wishes were horses, beggars would ride. So you blame your fate and switch on the television to watch a game. But the only game being played is a sport where the CBI, SEBI, and ED are chasing the owner of a defunct Kingfisher Airlines. Once upon a time, Mallya, a Rajya Sabha MP and entrepreneur extraordinaire, straddled the corporate and the sporting world with practiced ease. His passion for all things royal, including horses, was evident at a stud farm in Kanigal where horses are bred for Mallya’s United Racing and Bloodstock Breeders (URBB). Talking of horses, a horse, they say, never runs as fast unless there are other horses to outpace. In February 2016, when banks realized that they had bet on a wrong horse, an unbridled Mallya galloped away to London. He left with multiple bags, equivalent to the luggage of seven passengers. “For 2 people, 7 bags aren’t much. I pack heavy. That’s how I travel,” Mallya neighed. Once the stallion had bolted, opposition members climbed on a high horse. A Congress spokesperson said, “Mallya has run away from India using the ‘Fair and Lovely’ scheme of the BJP.” The BJP horsed around by saying, “Mallya is Congress’s baby. The UPA pushed banks to give him repeated loans.” Having closed the door after the horse had bolted, the finance minister, Arun Jaitley argued that the government couldn’t have put a cart before the horse because, “that day (March2, when Mallya left) there was no order of any agency to stop him from leaving the country. He left before the banks moved the Supreme Court for seizure of his passport.” The finance minister also gave a stern warning to defaulters to settle their dues or face ‘coercive action’. Well, you can lead a horse to water, but you can't force it to drink, right? In order to squeeze the last pip of our outrage, the television channels showed us old clips where Mallya is canoodling with bikini clad girls and pretty air-hostesses but there was little talk about the bank officials who horsed around with Mallya. Why did they bet on a sick horse? How were the valuations done in a sinking aviation environment? When most airlines were losing money, what business plan was accepted as gospel? And why? 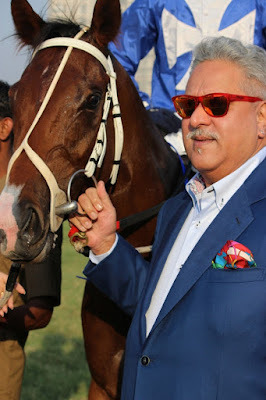 Given that Mallya chase has entered its last leg, Mallya got off from his high horse and offered to pay back Rs 4,000 crores by September,16. He claimed to be an Indian to the core who wants to return home. If buying Gandhi’s wire rimmed spectacles for $ 1.8 million wasn’t enough, Mallya can always say ‘Bharat Mata Ki Jai’ to prove his patriotism. Alternatively, he can take a return flight and bring Lalit Modi along. Let’s not play ponies, but who wants the Trojan to return? He could reveal sleazy details about politicians, bureaucrats, banks and the media being together in bed. So how do we win the Derby? Well, there is no point outraging in the Parliament when it does not lead to reforms in the financial sector. Bank distress is an old wound. There are many wounded horses listed by Credit Suisse in its report ‘House of Debt’. While the banks are contemplating a response to Mallya’s recent offer, the system will breed more Mallya’s unless the rot is addressed. Moreover, if the banks bargain for less than what is due, it will set off a dangerous precedent. When you and I can't get a small loan approval, imagine the audacity of negotiating with the banks via video-conferencing while sitting in London! What is clear is that Mallya horsed around not because he couldn’t pay but because didn’t want to pay. That said, the only thing shorter than public memory is public enthusiasm. Once we are done with ‘Mall-liya Bhag-liya’ jokes, we could happily queue up to watch a Bollywood movie called ‘Mallya Returns’. My choice for the title role would be Anil Kapoor. What say? Also on the Huffington Post. There is nothing left to say dear Alka. Politics,banks management,the different laws for different people-everything is in the pits. If a poor farmer cannot pay the loan he took to but a cow the cow is taken away and he is left to die. Sad reality of our times. I think the fundamental problem we need to be concerned about is why our media and popular culture make heroes out of such people to begin with. To be honest, I could never understand why this craze about these rich and mighty, about how they live, how they travel, who they are dating, what brands they wear, etc!! It is just so annoying, to say it very politely :) Thank God, I don't watch TV. Otherwise I would be perpetually annoyed! You raise a very relevant point about the bank distress. In some ways such abuse of system becomes easier when these rich celebrities are made to feel that they are above law, either because of the corrupt politicians backing them or because of the superstar status accorded them by the pop media. It is not only in India, it is everywhere that the rich and mighty abuse the system for their advantages while the ordinary folks can't even figure out how to navigate the complex labyrinth system meant to keep them in their 'ordinary place'. You are right, it's a universal phenomenon. If the media had raised a hue and cry over repeated bad loans instead of talking about the making of his calendar, things could have been arrested earlier. Great writing Alka.That was a real tongue-in-cheek humor. A complete blow by blow details about Mallya's horsing around. Yes, policemen chase and beat up a small child who steals a fruit because he was hungry, but when the money is so big, nobody does anything. Such is the state. Great Alka. Well done. Enjoyed. Unfortunately this is the reality:( a few like Sahara chief land in soup! It's a mystery why he didn't run away! Became a political pawn perhaps. When you please all, you please none. While your wordplay was galloping towards the finishing point, we were busy cheering for you from the stands. I hope the banks squeeze the last drop out of Mallya and then go running after the other defaulters who owe them thousands of crores. Arrgh....why, why, why does this happen? Scam after scam, billions and billions schemed and squandered away! And the good guys what do they do? Throw up their hands in despair! Brilliant writing Alka! I am now betting on the next rogue horse to get his share of limelight before bolting away to Spain maybe? Strange are the ways of the rich and famous. Clearly, nothing that applies to common people applied to them. Let's see if we can recover anything from him and others like him. The hue and cry has raised an alarm. Yes, it's a wait and watch. You are right, the law favors the rich and the powerful. Bikram, spank the man on the behalf of all his KF employees. That is if you bump into him while having a meal. Sad, yet thought provoking reality. 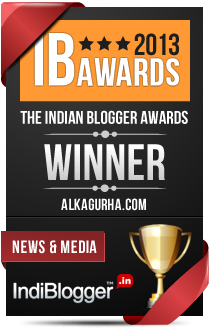 And so, so well-written Alka! The carriage of your post is powered by the metaphor of horses. You have added colour to the topic whipped to death already by contrasting your electricity bills with the unpaid dues of that delinquent billionaire. There is not much that I can add to your sparkling piece but I do wish to say one thing here: banks have been 'reformed' in the past by transforming their ownership to the state and banks may get "reformed" yet again by being privatised, but the need of the hour is to reform the moral fibre of this nation. Unless that happens, no reform is going to change the financial system or any other system of the society, and I am talking of institutions like education, health and politics. Vijay Mallya is the wild and mad stallion running when the race has not started, I bet. He must be high on Race Sanson ka....imagined to be surrounded by bikini clad beauties. On another note, the system is rotten and he is just tweaking it to his own benefit. Today, it's the King Fisher, tomorrow will be someone else. For how long, a poor farmer owning lakhs will be beaten up and King Fishers will get away with crime?